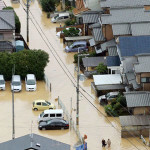 Record rains in Fukuoka and Oita prefecture on July 5 caused rivers to overflow and trigger mudslides. As of July 12, 29 people were found dead and 21 missing. The Disaster Relief Hinokishin Corps of Fukuoka Diocese were dispatched to Asakura City to assist in the recovery effort and distribute water. Women’s members of Fukuoka Diocese prepared meals at a nearby elementary school.